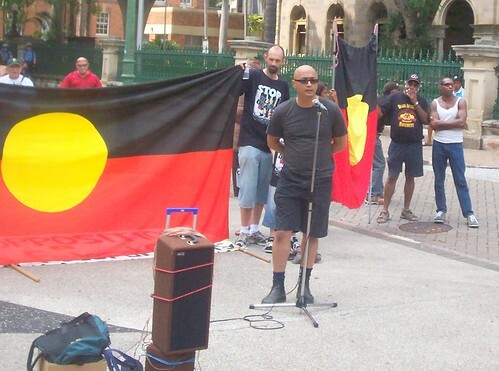 At about 10.15 AEST this morning, Andrew Boe (pictured above), who is the lawyer for the Palm Island Council, announced that S/Sgt Chris Hurley will be charged with manslaughter over the death of Aboriginal man Mulrunji in a police station on Palm Island in November 2004 - click here for the background info. Mr Boe was speaking at the Invasion Day rally outside the Parliament of Queensland, George St, Brisbane - click here to see the exact spot on a map. The Attorney-General of Queensland, Mr Kerry Shine, had called Mr Boe about five minutes previously to let him know about the decision. Mr Boe said that S/Sgt Hurley is expected to be indicted in Townsville on Monday. Mr Boe told everyone to be very careful about what they say now. In particular, anyone who has been angered by this case must respect S/Sgt Hurley's legal right to be presumed innocent. If people don't respect this right, the trial could be stopped because of prejudice - and there will be no chance for Mulrunji's death to be balanced. Mr Boe also said that he thinks a manslaughter charge is reasonable in the circumstances - he said he had watched every witness give evidence at the coronial inquest that found that S/Sgt Hurley caused Mulrunji's death. Finally, Mr Boe said that people should let the process occur, with 'grace and generosity'. The Australian newspaper also carries a report from the AAP, and the ABC reports the news as well. This is only the beginning of a very smoky process as you will witness every degree of trickery and deception in the so called Qld courts when they get started, that is if ever he does get indicted. The major hurdle to be faced is the religious background of the people who are involved within the judiciary and the Qld Police Union. There are two factions who attempt to control each other and the legal process and both control all other slaves employed within the judicial system by fear of reprisals being taken against anybody who does have a mind of their own. The process on this occasion does appear to be radically different to that which the ex Health Minister was presented with as he attended by way of a notice to appear for an offence described in Schedule 1 of the Queensland Criminal Code Act 1899. Both offences are Qld criminal code offences. I am not satisfied that the victims family will ever receive justice as that is not the role of the judicial process. I would prefer to see that a remedy is provided for the family of the victim, and that should be the million dollar property on the Gold Coast. Stake a claim now and lock it up by way of a caveat before the Police service does for the cost of the defence. Young Dan, there's a bit I'd like to say in reply, but to be safe I think it should wait until after the trial. facing in the wrong direction anyway. A further understanding of these reasons can be gained from reading the reasons for the decision in the resulting civil claim heard in the Qld Supreme Court in Townsville in the matter of Coleman v Greenland, Donaldson, Powers etc & The State of Queensland  QSC 037. The one Supreme Court district that the Qld Police Service Union does not want this matter to be dealt with is Townsville because of the previous matters in which the lawful authority of power to arrest and detain under the Police Powers and Responsibility Act was decided. I suspect that the Coroner was fully aware of these authorities which may have caused the statement in her report that he should not have been arrested and detained. While I'm sure the Police Union is acting in bad faith, when they complain about no cameras in police stations, I think it is great that they find themselves in a position where they have to do that. If they were sincere, they would have demanded cameras long ago. (Cameras that can't be turned off or turned away, that send signals immediately to a remote location, and that are capable of recording any attempt to tamper with them would be a good start). But a good thing is a good thing, even if it is being promoted for dishonest reasons. However in the meantime the police officer st Hurly and his family as well as the police dept were continualy lied about by those people who can do no more than stir up trouble whether it be religious or racial. What a lot of people do not understand is these very complainers are for the most part living on taxpayers money. welfare and the money that is spent on the aboriginal population is per capita much higher that which is spent on any other race. And perhaps it should be pointed out that the real victim is the police officer who was doing his duty. and the persons who committed the offences against the police officer have no assetts no manners and no morals. They should all thank God that they live in Australia. 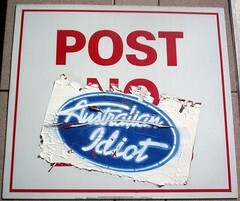 Many other countries whould not let aggitators and liars walk the streets or perhaps I should say pollute the streets. THEY SHOULD WAKE UP AND GET A JOB AND GET A LIFE.. I am sick of paying my taxes to keep them.